Phones4U taking BlackBerry Q10 pre-orders, giving away PlayBooks | BlackBerry Blast! BlackBerry QWERTY keyboard diehards are still waiting for the Q10 to be released and it won't be long now. UK retailer Phones4U is now taking pre-orders on the Q10, and is even giving away a free BlackBerry PlayBook to the first 300 customers who order. London, UK, 5th April 2013: Phones 4u has today made the new BlackBerry� Q10 smartphone available to pre-order in both black and white, and is offering a free 64GB BlackBerry� PlayBook� tablet to the first 300 customers who choose to pre-order the BlackBerry Q10 smartphone through Phones 4u. After being the first retailer to range the BlackBerry� Z10 smartphone in white when it launched in the UK, and after enjoying an exceptional response to the smartphone in both its white and black variants, Phones 4u is confident that the BlackBerry Q10 will be received just as positively by consumers looking for the power of BlackBerry� 10 with a classic BlackBerry keyboard AND a touch screen. � The ever present BlackBerry� Hub, which brings all your conversations together in one easy to manage place that you can access at any time from any app with a simple "peek", so you're always only one swipe away from what matters to you. � BlackBerry� Balance� technology, which elegantly separates and secures work applications and data from personal content and lets you instantly switch between your personal and professional profile for easy access to work apps and data. � BBM� (BlackBerry� Messenger), which lets you harness the power of collaboration and exchange ideas in an instant. BBM in BlackBerry 10 includes voice calling and video chat, and lets you share your screen with another BlackBerry 10 contact. � BlackBerry� Remember, which helps you tackle tasks quickly with a new way to collect, organize and action all the information sitting in different places across your smartphone. The BlackBerry Q10 in black will land at Phones 4u at the end of April, with the white arriving in the weeks following this. Available to pre-order in black and white at Phones 4u from today with a free BlackBerry PlayBook for the first 300 customers, the BlackBerry Q10 will be free from �36 a month on contract, and �549.95 SIM-free. 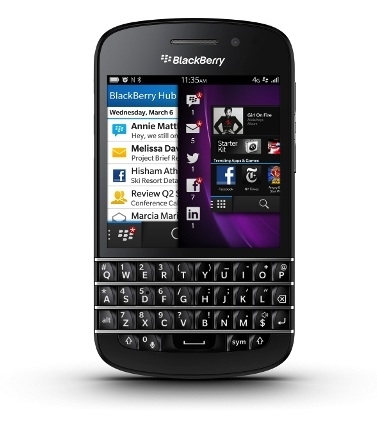 LONDON, 5th April, 2013 � The new BlackBerry� Q10 smartphone is now available to pre-order at Carphone Warehouse. The highly-anticipated new handset will be available to purchase across all networks and in stores nationwide from the end of April. Eager BlackBerry fans who don't want to wait can pre-order at http://www.carphonewarehouse.com/mobiles/mobile-phones/BLACKBERRY_Q10 - the first 2,000 Pay Monthly customers will receive a free Wireless Bluetooth speaker worth �79.95. The BlackBerry Q10 will be available to pre-order from Carphone Warehouse on O2, Orange, T-Mobile, Three, EE and TalkMobile, free from �36 per month* and �579.95 SIM-free. The 4G-enabled BlackBerry Q10 smartphone combines BlackBerry's best physical keyboard and a touch screen with the power of the BlackBerry� 10 platform to help customers communicate and collaborate faster and more efficiently. The BlackBerry Q10 includes advanced hardware, communications and multimedia features, as well as long-lasting battery life. � The ever present BlackBerry� Hub, which brings all your conversations together in one easy to manage place that you can access at any time from any app with a simple "peek". � BlackBerry� Balance� technology, which separates and secures work applications and data from personal content and lets you instantly switch between your personal and professional profile. � BlackBerry� Remember, which helps you tackle tasks quickly with a new way to collect, organise and action all the information sitting in different places across your smartphone. Graham Stapleton, Chief Operating Officer at Carphone Warehouse, says, "The new BlackBerry Q10 takes everything that's great about the recently launched BlackBerry Z10 and adds a physical QWERTY keyboard � perfect for users who still prefer the physical push of a button when using their devices. BlackBerry's new handsets are innovative and modern and the new operating system gives customers a brilliant alternative to others out there at the moment. The BlackBerry Z10 has proved extremely popular and we're certain that our customers will be very keen to get their hands on the new BlackBerry Q10. Furthermore as the only retailer that stocks all the networks, we're offering customers great deals." Customers can pre-order the BlackBerry Q10 smartphone at http://www.carphonewarehouse.com/mobiles/mobile-phones/BLACKBERRY_Q10.